The Magical Smiles website contains beautiful designs and a layout of distinct colors that sets it apart from most of our other dental website designs. With a clinic dedicated to helping fearful patients feel comfortable and safe in their dental care, and a goal clearly set to welcome not just the visitor, but their entire family, the Magical Smiles website reflects everything they wanted to say to their patients. 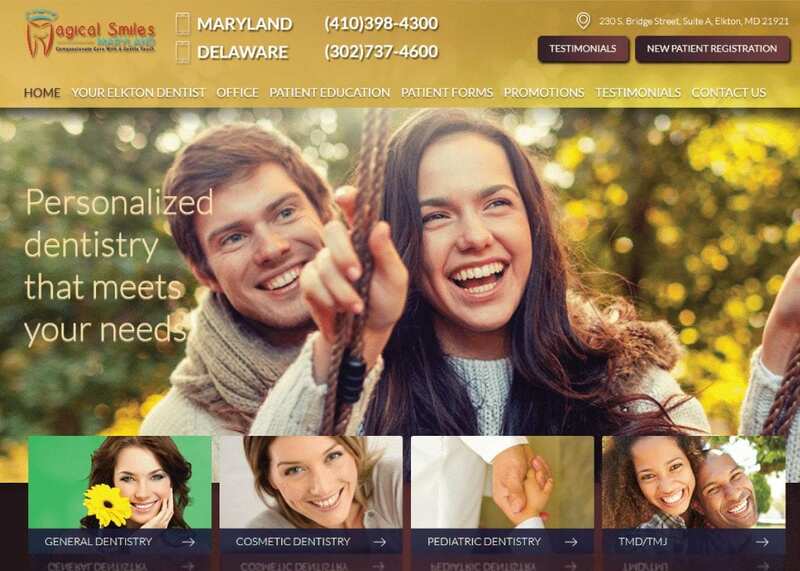 The overall design of the website is a striking combination of colors and imagery brought together to represent a dental office that is dedicated to comfortable, happy relationships with their patients. You are immediately invited to register as a new patient, read testimonials, or to give them a call and schedule your first appointment. The gold tones of the opening page is both yellow and brown in its tones, while the darker colors are reminiscent of reds and browns, with a splash of purple. Combined with the beige tones it comes together to create a distinctive display that will embed itself in the memories of the visitor. Used in conjunction, these colors help to produce a sense of confidence and comfort in the visitor that cultivates the idea that their experience with this facility will be welcoming and rewarding. The choices of this design develop a feeling of warmth and relaxation, reminiscent of those days at the end of summer before the cold chill of fall starts to set in. Here are celebrations and the reaping of rewards, with the coming together of family being present in the coming days. The same welcoming sensation that the autumn days produce are promised by doing business with this organization, from the immediate presentation of the phone number to the bright smiles of the couple in the initial image. Even the images selected to direct the visitor to additional information about the treatments are selected to produce this sensation. A visitor to this web page is greeting with a bright smile, two phone numbers for contacting the office, and a warm inviting smile. Throughout the website you’ll find notes about keywords selected, from “Pediatric Dentistry” and “Generic Dentistry” being worked in to links at the bottom of the page to a series of offered services listed bullet-point style as you scroll down. The testimonials were specifically selected to reflect the comfort and ease of fear that was experienced by patients with an expressed phobia of dentists. From the services they need to the bedside manner they want, it’s all represented in this layout. Warm late summer days and a family atmosphere are the immediate impressions given by this website. The office clearly wants its patients to feel welcome and settle in for generations of family care. This office recognizes that your dentist is the physician you see the most, and its important that they be able to treat all the concerns your family has to face. This site reflects that awareness and a genuine concern for the comfort and happiness of those who get dentistry done here.